In our last issue we concluded with a mention of the Shearer horn and its influence on subsequent theater systems from a number of manufacturers, including Western Electric. One of WE’s post-Shearer systems was known as the Mirrophonic system; a Mirrophonic M2 system was exhibited at the Munich High End show recently, hauled all the way from South Korea by the wonderful and wacky crew at Silbatone. That’s a picture of it atop the page; you can also see more pics in this issue’s Munich pictorial. Mids and highs (up to maybe 10kHz on a good day) were handled by two WE 594A field-coil compression drivers feeding a 26B multi-cell horn; woofery was by 2 of the hefty and legendary TA-4181 18″ field-coil woofers set in an open-backed horn. 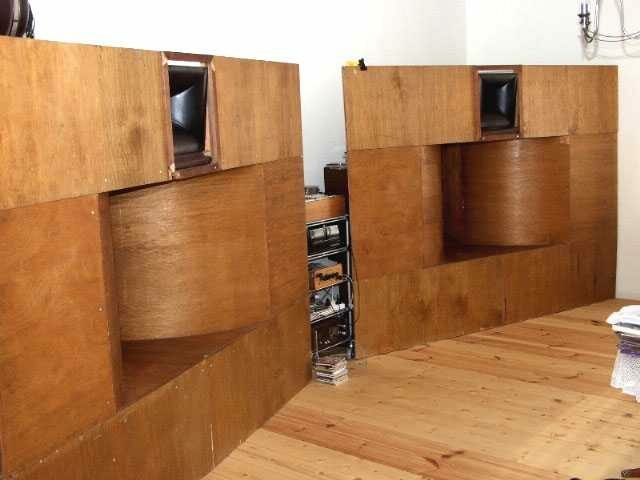 That’s per side, of course; keep in mind that a mono system was designed for a 3000-seat theater, and you’ll get an idea of the dynamic ease this stereo pair presented in the Munich exhibit room, with maybe 100 seats. Maybe. I’m not sure how other companies like RCA operated, but Western Electric theater systems were never sold—like WE telephone equipment used by the Bell system, they were leased by the user, and maintained by WE techs (or those of Graybar, the sales arm). Choosing, designing and maintaining a theater system was no small task—and wisely, WE didn’t leave those jobs to amateurs. While both RCA and Western Electric had Shearer-inspired systems (including the WE Mirrophonics like the M2 shown above), the only company authorized to use the Shearer name was Lansing Manufacturing, a small company in LA which had stated business in 1928 building stand-alone loudspeakers for radio sets. 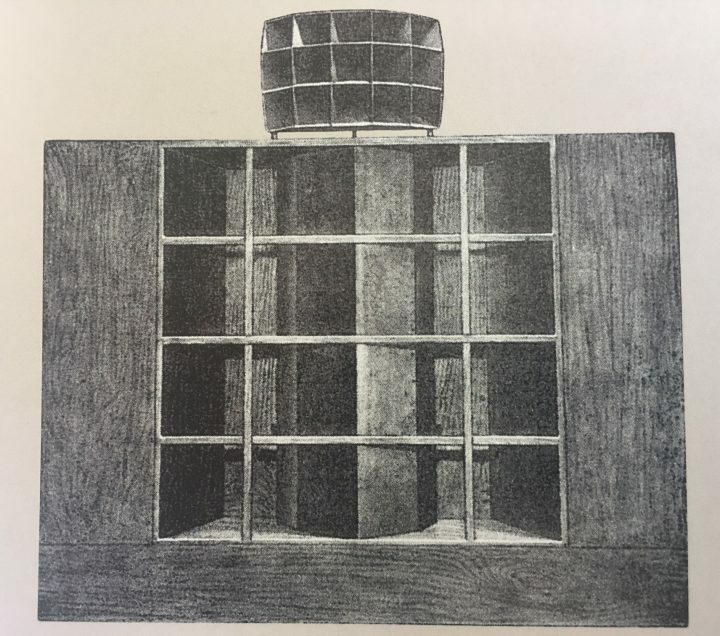 The Shearer-Lansing system had a w-shaped horn enclosure for the bass, topped by a multicellular horn with a compression driver. Both drivers had field-coil magnetics, and crossover was around 500 Hz. Frequency response was specified as 40 Hz-10 kHz, adequate for the frequency range reproduced by the contemporary optical sound systems. A smaller version of the Shearer-Lansing system, known as the 500-A, was used for sound reinforcement and in recording/dubbing facilities. In the late ’30’s an even smaller system was developed as a monitor. The Iconic, as it was known, was also offered with deco-style cabinetry for home use. The Shearer-Lansing 2-way system, as shown in period literature. In 1978, more than forty years after the publication of Shearer’s paper describing his proposed sound system, the AES found its influence lasting and significant enough to prompt reprinting of the paper. Even today it’s a remarkably thorough and cogent analysis of the requirements and problems of the design of a theater sound system. I should point out something that is likely obvious: this series of articles has a decidedly American slant. Part of that is due to my own limited knowledge of horns of other lands, and part is due to the lack of reference material on old horn speakers—especially, reference material in English. Having said that, theater sound systems were made in many countries other than the US. Western Electric systems were made in the UK under the Westrex name, and probably the most-famous theater speakers made somewhere out there were those made by Klangfilm in Germany. The massive Bionor system is shown below; some years back, a pair of these monsters were used in a THE Show-Las Vegas exhibit room. I regret to say that I didn’t hear them; even so, it amuses me to think of the nightmares involved in getting those babies hauled around Vegas and set up there. I suppose the freight and drayage guys had seen even weirder things in the past. What happens in Vegas, yadda yadda…. Back stateside, major upheavals in the world of sound-reproduction were caused by the federal government, of all unlikely players. In 1938, the feds came down with an anti-trust decree—-remember those? ?—ruling that Western Electric possessed a monopoly in the world of motion picture sound. WE was required to get out of the sound-hardware business, including loudspeakers and amps, and remaining inventory was sold to a group of WE engineers. The new company, Altec (a corruption of “all technical”), carried out existing service contracts. After a few years the new company was running out of hardware and replacement parts, and a purchase of Lansing Manufacturing was negotiated. The new Altec-Lansing company provided the perpetually-struggling Lansing with adequate resources, and the combined catalogs of the two companies ironically assured the new firm of a virtual monopoly in motion picture sound for years to come (presaging the breakup/reunification of the baby Bells 40 years later). John Hilliard, who had previously worked on the Shearer-MGM project, joined Altec-Lansing, and in 1945 Lansing and Hilliard published “An Improved Loudspeaker System for Theaters” in the Journal of the Society of Motion Picture Engineers (which can be read here).The paper described the design of the model A-4 of the Voice of the Theatre line, which would be the standard in theaters worldwide for 40 years. Part of the Lansing-Hilliard paper. The driver should look familiar to anyone acquainted with WE or JBL drivers. 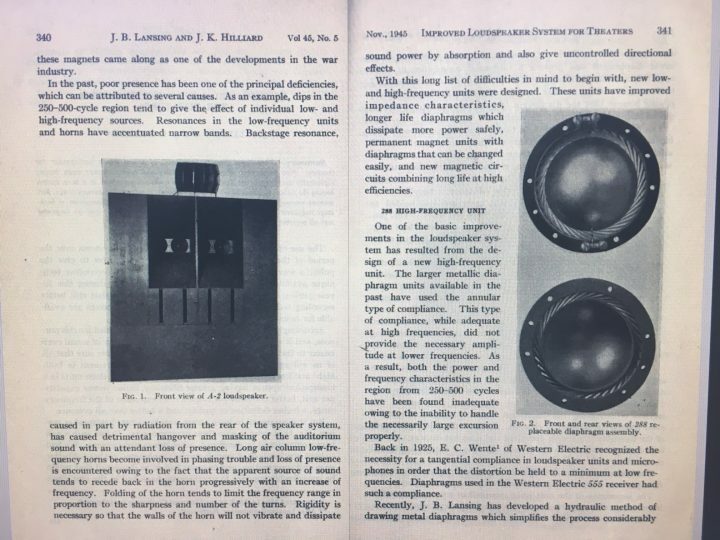 The statement, “World War II would bring significant changes” would be true of nearly all aspects of life, but it did bring major changes to the world of loudspeakers. The wartime development of high-intensity permanent magnet materials including Alnico (more properly, AlNiCo, a family of iron alloys salted with Aluminum, Nickel, and Cobalt) would allow the development of drivers freed of the constraints imposed by the use of field-coils, which were essentially electromagnets—and thus required power supplies. The A-4 Voice of the Theatre’s newly-developed drivers utilized Alnico magnets, and were at the cutting edge of the new development. Other changes would arise in the world of horn loudspeakers, post-war. We’ll pick up our story there, in the next installment.